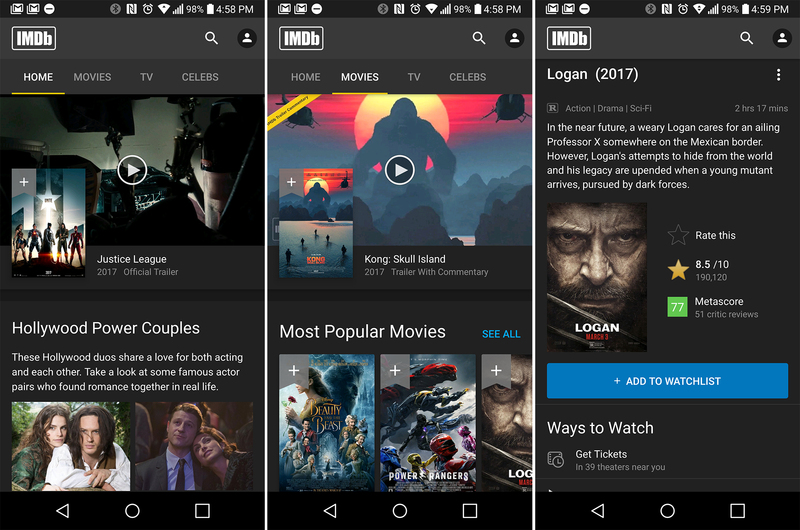 The IMDb app is just one of those things you probably have installed without thinking about it. There are times you just need to know who was in that thing, you know the one. That thing, with the guy. He was also in that other thing. Now, the IMBd app is going to look quite different when you go in search of these answers. The latest update to v7.0 brings the first of a series of major UI changes to the app. Here's the changelog. It was just a year ago that IMDb went fully material. The removal of the navigation drawer is probably the most notable change. The app has a very different feel now with tabs across the top that provide access to different areas of the app. The carousel at the top also has a very cool sliding animation. There's still a search button at the top of the app. It's right next to the profile button, which is where you find your watchlist, ratings, and so on. That's all stuff that used to simply be dumped in the navigation drawer. The update is still rolling out in the Play Store (fully out in the beta channel), but it's on APK Mirror as well.